Home > Uncategorized	> After the “Thirty Glorious Years”? After the “Thirty Glorious Years”? On the eve of their presidential election, the French people and politicians continue to debate how they should respond to the end of “Les Trente Glorieuses,” a period that appears to receding into ancient history. Except, as it turns out, for those at the very top, for whom the last thirty years have been quite glorious. the growth incidence curve is characterized by an impressive upward-sloping part at the top. Cumulated growth between 1983 and 2014 was 31% on average for the bottom 50% of the distribution, 27% for next 40%, and 50% for the top 10%. Most importantly, cumulated growth remains below average until the 95th percentile, and then rises steeply, up to as much as 100% for the top 1% and 150% for the top 0,01%. The contrast with the earlier, 1950-1983 period is particularly striking. 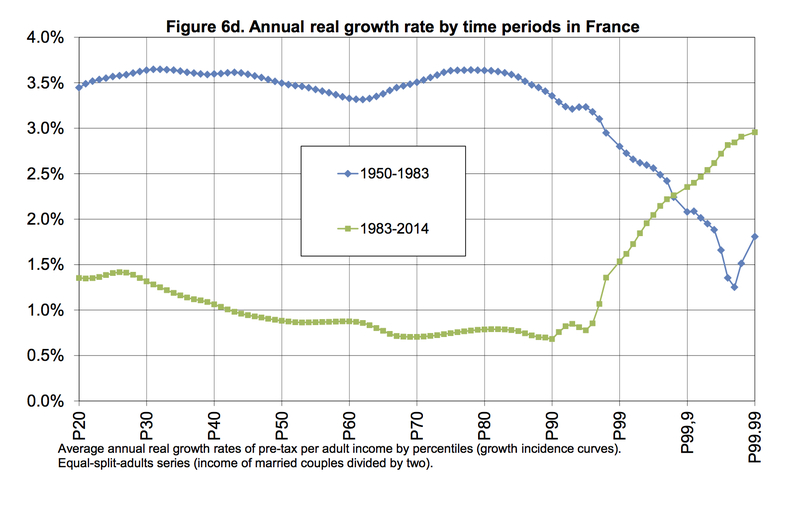 In effect, during the “Thirty Glorious Years,” Garbinti, Goupille-Lebret, and Piketty observe the exact opposite pattern: growth rates were very high for the bottom 95 percent of the population (about 3.5 percent per year) and fell abruptly above the 95th percentile (1.5 percent at the very top). However, as is clear from the chart above, between 1983 and 2014, growth rates were very modest for the bottom 95 percent of the population (about 1 percent per year) and rose sharply above the 95th percentile (3 percent at the very top). As we know, similar patterns hold for the United Kingdom (which voted for Brexit) and the United States (which elected Donald Trump). The key question in France, in the first and second rounds of the presidential election, is how French voters will respond to a political economy that has generated thirty glorious years only for those at the very top. The French, like the Americans, will be reacting to their circumstances and elect a leader who will be powerless unless he/she gets into bed with the ever present background financial manipulators. That’s how “democracy” works. It always did. It is the failure of the left, in the U.S. as elsewhere, to come up with a more constructive version of economic nationalism, without jettisoning the constructive strands remaining in international co-operation, economic, diplomatic and militarily – strands that are shredding and popping almost daily, it seems to me. We are on a prescribed path to trade wars, followed by shooting wars, in order to preserve the privileges of the few. It is a cyclical phenomenon. In everyday discussion left-wing politics is assumed to support social (including economic) equality and egalitarianism, often in opposition to social hierarchy and social inequality. Typically leftism involves a concern for those in society considered as disadvantaged relative to others and a general belief that action is necessary to reduce and abolish such unjustified inequalities. Social justice (equality under the law) along with economies that distribute wealth fairly are priorities for leftists. Who would oppose such beliefs and actions? Obviously, those who live in or support social hierarchy and social/economic inequality. So, why is the right-wing on the rise? Simple formula – those who benefit from inequality attack everyone who disagrees with them and then promise the most vulnerable (the most oppressed) that fascism offers them a way to control and hurt those who are oppressing them. This is the formula followed by Breitbart and indirectly by Donald Trump. Fascism’s great strength and fascination has always been that it’s an in-group vs. out-group movement. If you want to be in-group you have to follow without question. Otherwise, you are out-group and an enemy. Simple, but it works. It worked for Hitler, for Mussolini, for Pol Pat, for Mao, and for today’s American Nazis. It’s difficult for leftists to counter this formula. After all, they can’t promise anything except a chance for more equality and democracy. No way to get even with oppressors. Trump is repeating exactly the same script that has guided neoliberal policy for over three decades. We cannot understand social theories (like economics) outside the historical context.